With over 1,500 installations in North America, Europe and Australia, PolyGrate™ provides the best value for your project dollar. It has been specified by city planners, municipalities, landscape architects, contractors, civil engineers, and commercial real estate developers for new and retrofit projects of all size and type. Purchase PolyGate on our website or through one of our network distributors. Please contact us at 800.523.6899 for more information. 3-foot round plastic tree grate at playground for daycare facility. 4-foot square tree grate for a row of trees along city pedestrian sidewalk. 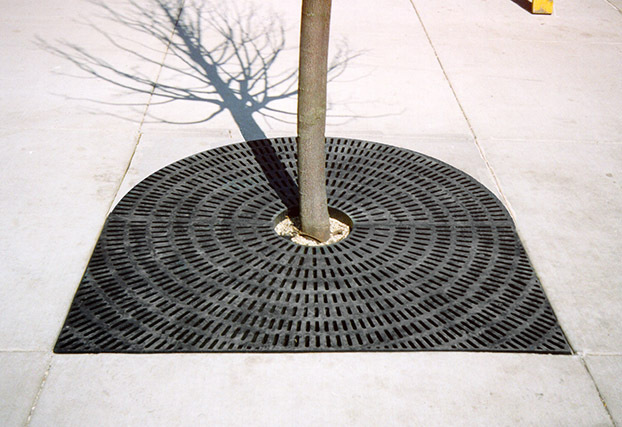 Square tree grate on brick pedestrian walkway with concrete surround. 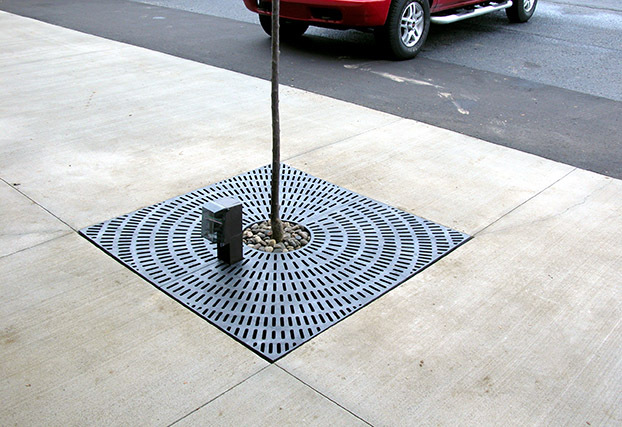 8-foot rectangle plastic tree grate for pedestrian walkway. 5-foot square tree grate with a new concrete surround. 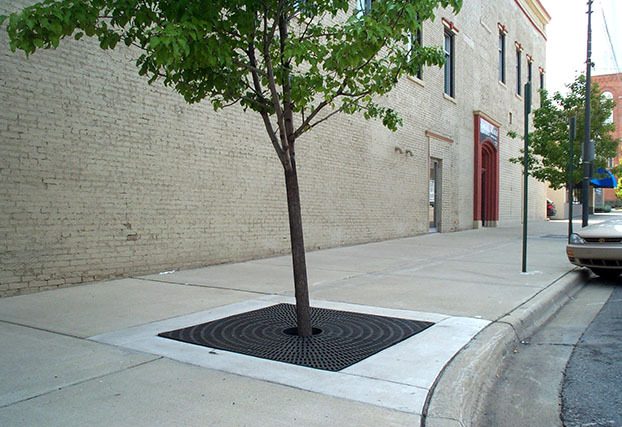 Combination round and square plastic tree grate for pedestrian sidewalk. Step 1 of tree grate installation: Attach PolyGrate frame support bar into concreate. Step 2 of tree grate installation: Fill tree pit with self-compacting aggregate. 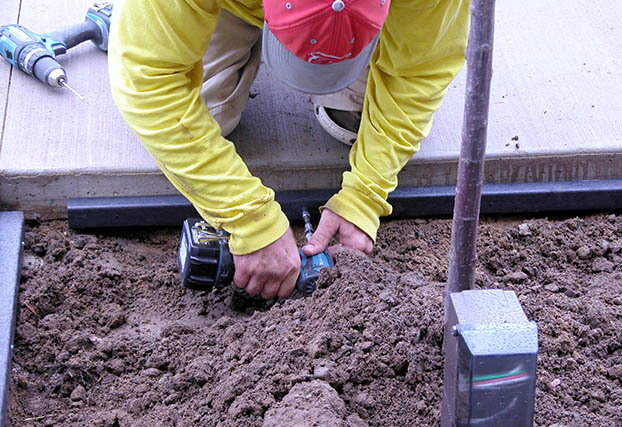 Step 3 of tree grate installation: Join halves with tamper-resistant bolt. Step 4 of tree grate installation: Lower grate into place. 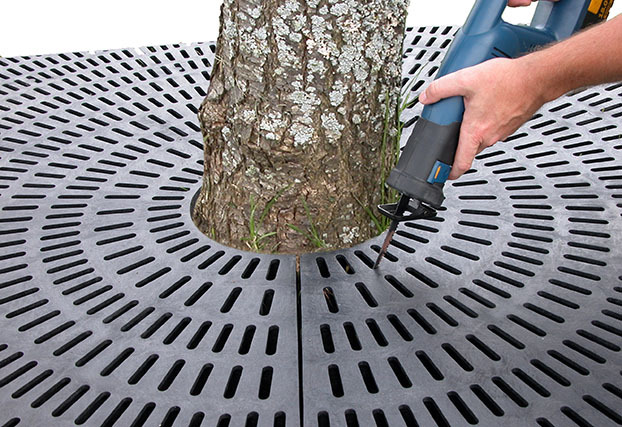 Easily expand tree grate hole opening with a common saw to accommodate tree growth. 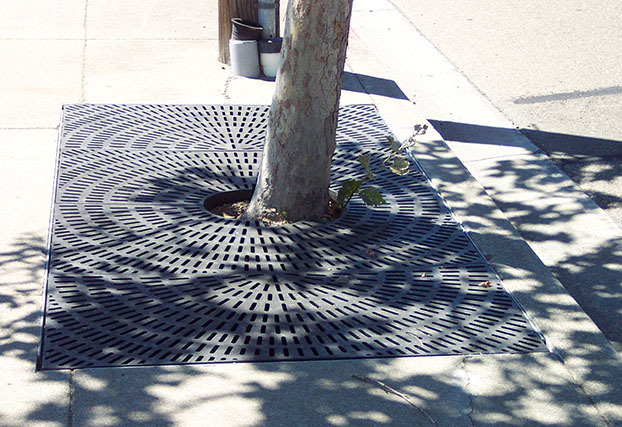 Square tree grate in wide city pedestrian walkway. PolyGrate™ Recycled Plastic Tree Grates are the most affordable, easiest to install and maintenance-free pedestrian sidewalk tree grate solution on the market today.Made from 100% post-consumer plastic with UV inhibitors, our tree grates are extremely lightweight, durable, easy to install, and costs about one third the price of an iron tree grate. PolyGrate™ maintains a smaller carbon footprint through reduced fuel consumption, lowercarbon emissions, and its lightweight design for shipment and installation.